REMEMBER WHEN PEOPLE HAD DIARIES AND GOT MAD WHEN SOMEONE RE - ProudMummy.com the Web's Community for Mums. 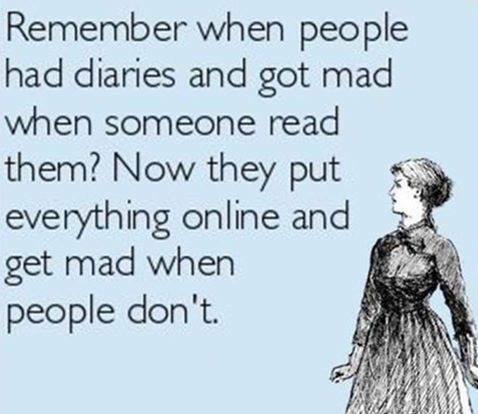 REMEMBER WHEN PEOPLE HAD DIARIES AND GOT MAD WHEN SOMEONE READ THEM? NOW THEY PUT EVERYTHING ONLINE AND GET MAD WHEN PEOPLE DON'T.